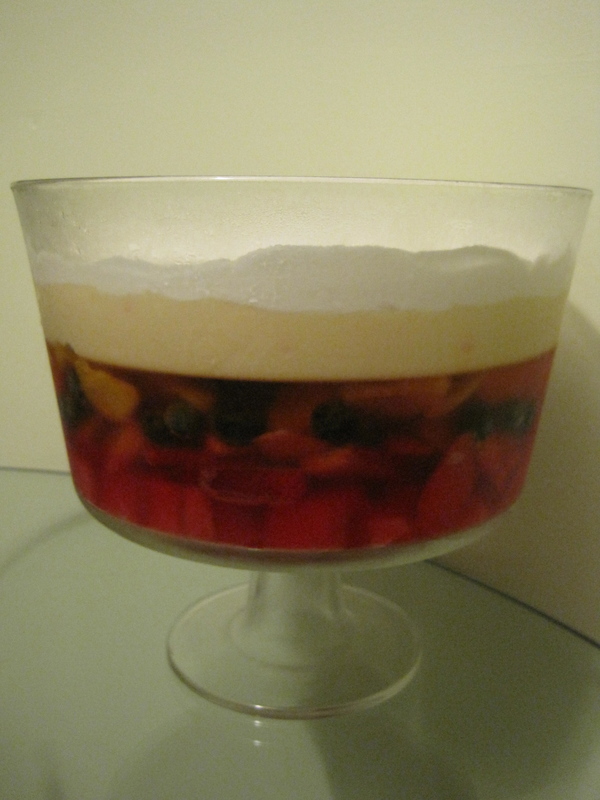 I am going to make an old school trifle today. I have family coming over for dinner tomorrow and I wanted to change up the usual baked fruit in pastry or crumble typical for cold weather dinner endings. The ingredient list sounds like it came straight from the 70’s where jello, mayonnaise and Kraft were cutting edge innovators in home cooking. So let’s see here… raspberry jelly roll. Check. Strawberry jello. Check. Canned custard (just because it’s faster). Check. Strawberries that look nice but probably won’t taste like a real strawberries. Check. Whipping cream. Check. Canned fruit. Check. Sprinkles. Check. I have to admit there was a mild guilt buying this crazy array of items. Who eats this way anymore? I’ll have to report back how it tastes. It certainly looks inviting but you know, it’s been maybe thirty years since I’ve sunken my teeth into a jelly roll. That was right around the same time when Half Moons, Ah Caramels and Twinkies were staples as grade school snack options. Update: This post was written before Christmas and I forgot to post it! The trifle was a hit! The best part was hearing the big squelch when I dug into the jello part!